Buddha Magnum Autoflowering - Strain Review – Feminized, Autoflowering and Regular. The Magnum marijuana strain is indeed the “magnum opus” of the Buddha Seeds seed bank. A miracle of modern breeding, this strain reaches impressive sizes and offers unusually plentiful yields for an autoflowering variety. Buddha tried to combine the best of all worlds in this strain, and judging by the result, they succeeded. The Magnum is a flagship autoflowering marijuana strain, bred and sold by the Buddha Seedbank. Contrary to most auto seeds, it reaches impressive sizes and branch development: A fully grown Magnum can grow to be 5 feet in height and yield up to 5 oz (142 gr.) of yield per plant. Despite its massive size, this strain can be confined in smaller pots, according to Buddha Seeds. However, if you have available space, or you can grow outdoors, you’ll see the Magnum revealing its true power! Why buy Buddha – Magnum Autoflowering Feminised Seeds here? As many of you probably know, the world of marijuana breeding is highly competitive. Sometimes breeders are reluctant to reveal the genetics behind their biggest hits to avoid knockoffs by rival labs. Although little is known about the Magnum, we know for a fact that it is a cross between three (unknown) strains. Buddha Seeds won’t reveal which exactly are they, leaving the guesswork to us. What we do know is that the Magnum is an impressive autoflowering, feminized, Sativa-dominant strain with a fast and explosive growth. The yield and growth are far above average for an autoflowering strain and the leaves are typically sativa-like. These hallmarks, along with its taste and smell, lead us to believe that there is definitely some Haze and Jack Herer included in this mix. 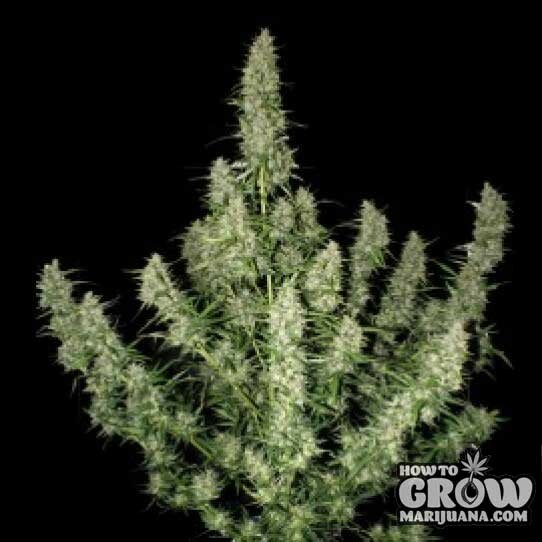 As with any autoflowering variety, the Magnum is a very easy grow both indoors and outdoors. Due to its size, some growth manipulation method, such as SoG or ScrOG is necessary to control its development, especially if you are growing in small grow rooms. Alternatively, you can use small containers or delay the transplant to help manage the size. Of course, if you have ample space available, stick it in a large container and let nature work its magic! Things indoors could hardly be easier: just set your light timer to a 20/4 light cycle and let the plant develop by itself. This is the magic of autoflowering cannabis in all its glory! A small crop of four plants will thrive under a 600W grow light and will yield about 17 oz. (500 gr.) of dry herb in total. This plant can reach its full potential outdoors, reaching flowering in less than 2 months and reaching enormous sizes. A single plant can get you about 7 oz. (200 gr) of dry herb. And it’s not like the flower is bad quality either: Reports indicate that the buds are covered in sticky resin rich in THC and offer a great smoking experience. Growing autoflowering plants is easy but comes at a price: Usually, the yield is less than satisfying and the quality of the bud is slightly off the mark. The Magnum changes all that, adding vigorous growth and potent buds to an easy growing experience. The Magnum will flower in about 60 days from seeding. You can expect yields of 500 gr. per sq.m. indoors and up to 200gr. per fully grown plant outdoors. Magnum Auto has a pungent and fresh smell that points towards its sativa heritage. The flavor is spicy and the effects are highly cerebral, uplifting and energizing. Really, the worst thing that can happen with this strain is an uncontrollable laughter that might make you seem weird. Other than that, the Magnum is a typical sativa dominant strain, with all the giggles this entails!! The Magnum is a cross between three potent and high-yielding strains whose identity remains a well-kept secret of the Buddha Seedbank. Although we don’t know where it comes from, the results speak for themselves: The Magnum is an unusually tall and productive plant, especially for an autoflowering variety. Outdoor growers will enjoy this beast in all its glory, while indoor gardeners will have to take some measures to prevent it from reaching full growth. The taste of this strain is fresh and pungent, creating an uplifting effect that gives away its sativa origins. Vesta is a hybrid by -you guessed it- Buddha Seeds and comes from two mysterious known parents of American and European origin. Compact, high-yielding and vigorous in growth, this strain is remarkably easy to grow, even by newbies. Buddha claims that its taste is a combination of European genetics, which is responsible for the fruity undertones and American breeding, that added a nice, sour taste and a powerful relaxing buzz. As beautiful as it is productive, the Kraken releases a plentiful and heavy yield, guaranteed to satisfy those who seek the ultimate return on investment. The taste of the Kraken is fresh and rejuvenating, while the hit is strong and long lasting! Pulsar by Buddha is a great cross between two unknown European and Central American sativas. The sativa heritage means that this plant is aggressively vigorous and highly productive. So, if you are planning on growing indoors, you better utilize some training method to constrain its growth. Outdoor growers are also advised to plant the Pulsar a little later than normal, to avoid growing an uncontrollable monster! The taste and smell of the Pulsar are unmistakably hazy, offering a cerebral and energizing effect that will surely put a smile on your face. Overall, this is an amazing choice for experienced growers and serious smokers. A cross between potent autoflowering strains with indica varieties, Syrup is a highly narcotic strain with great medicinal properties, as the name suggests. In addition, this strain has a pleasant taste, with hints of ginger and fruit. Great for fans of mellow strains and growers who like to keep their garden on the smaller side. A discreet autoflowering strain, White Dwarf was bred with convenience in mind. It is short, durable and fast flowering. A great choice for absolute beginners who want to make sure their first grow goes as smoothly as possible. As you might have probably guessed by the name, Purple Kush hails from the Kush region of the Indian peninsula. Its compact size and quick flowering will make it a favorite among impatient growers. The plant itself is beautiful, with purple buds and orange pistils. The taste is intense, with hints of sandalwood. The buzz is mellow and physical, without extreme cerebral effects. The Red Dwarf is essentially a sister strain to the White Dwarf as they share a common ancestor. The difference is that the Red Dwarf was crossed with a Skunk female. The result is a short autoflowering plant, with potent and plentiful buds. Ideal for growing in confined spaces. An indica-dominant hybrid, Deimos originates from prestigious parents like Northern Lights. According to Buddha Seeds themselves, it took over seven generations of careful breeding to develop an autoflowering strain that bears all the characteristics of a regular plant. As a result, Deimos is quite bulky, growing both wide and relatively tall, with all branches yielding equally well. The plant won’t grow over 3 feet tall, making it ideal for both outdoor and indoor grows. The taste of the bud is sweet and pungent, while the effect is deeply relaxing. Quasar combines the best qualities of pure indica and backcrossed sativa in a highly efficient plant that eliminates flowering times and maximizes yield. Especially outdoors, this strain will yield amazing results, with bud production reaching up to 2 kg per plant! Last but not least, a CBD powerhouse strain: The Buddha Medikit measures up to 20% in CBD content, making this an amazing medicinal strain. This plant is a hybrid between sativa (Californian Harlequin) and Latin American CBD-rich varieties. The taste of this strain is something else, as the high terpene level translates into a fruity, citrus-like palate. Some users might detect hints of mango and pine in the Medikit. To top it all off, this strain is very productive, with outdoor grows reaching up to 1500 gr of dried product. 12.3oz – 14 oz (350gm – 400gm) per M2 indoors. 2.8oz – 5.3oz (80gm – 150gm) per plant outdoors.